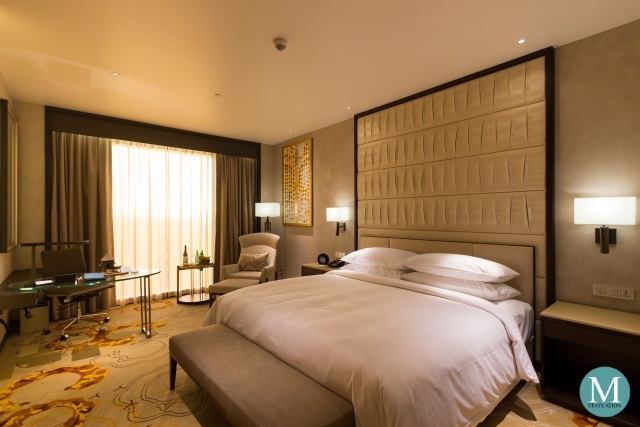 The Deluxe Room is the lead-in guest room category of Sheraton Manila Hotel. 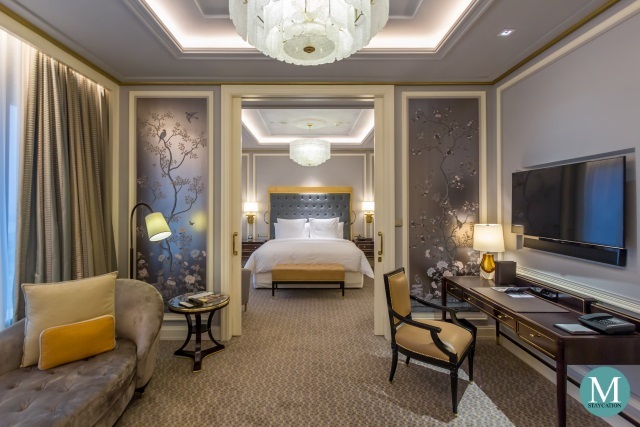 Measuring 44 square meters, the Deluxe Room is available in a king bed or two queen beds configuration. 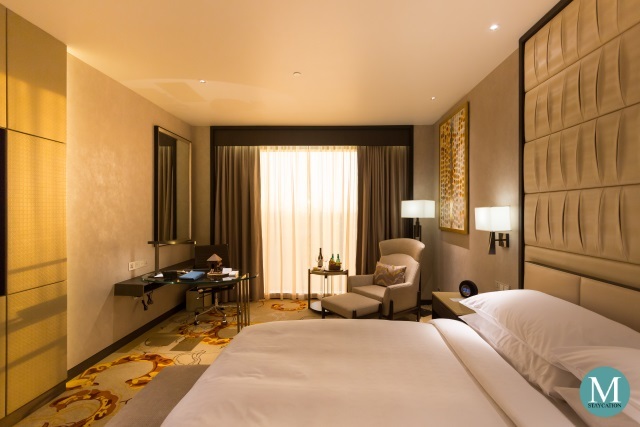 Guests may also choose to book a Deluxe Room with a pool view or a city view. 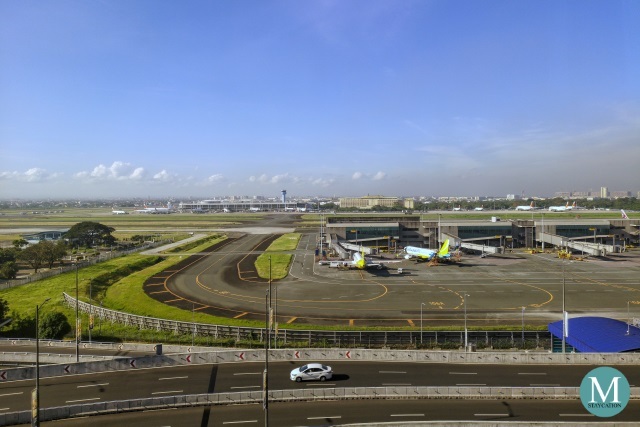 We stayed at room 653 which is a Deluxe Room with a city view and faces directly across from terminal 3 of Manila's Ninoy Aquino International Airport. The view from my room shows the boarding gates for international flights. At the background, you can actually see airplanes landing and taking-off. If you love plane-spotting, the Deluxe Room with a city view is perfect for you. The view is perfect in the morning when the sun is on the opposite side of the room. In the afternoon, the room will be facing directly the sun. Thanks to the double pane glass windows, the room is insulated from external heat and noise. You can also draw the sheer or blackout curtains if the sunlight is too bright for you. 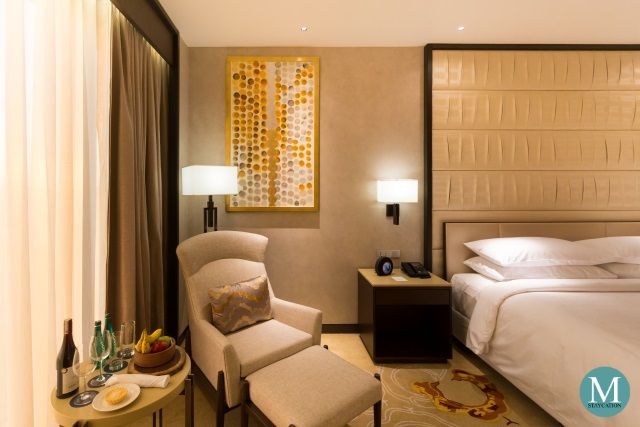 The Deluxe Room at Sheraton Manila Hotel has an earth-tone theme with splashes of gold and silver. 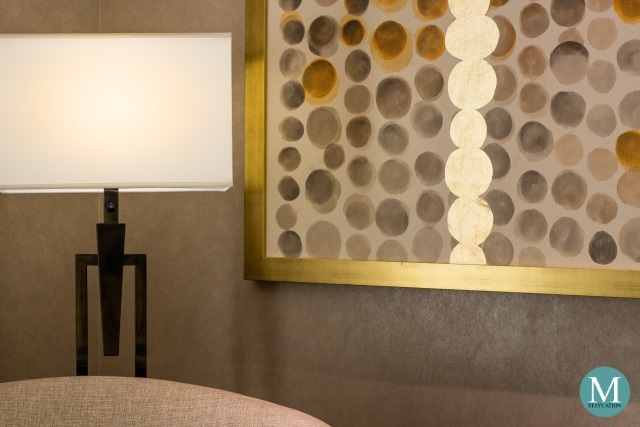 As the sun sets from the horizon, the interior of the room turns golden yellow, making the room feel more glamorous. The room is also filled with artwork and crafts inspired by the local culture. 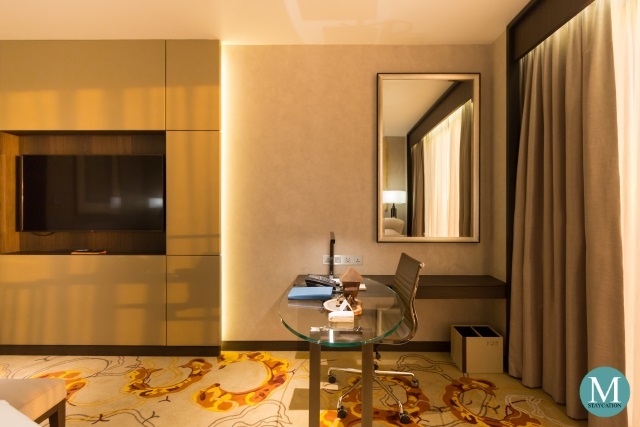 Consistent with the Galleon Trade theme of the hotel's design, the Deluxe Room also expresses the same inspiration through an artwork that depicts silver and gold Spanish coins, the currency which fueled the commercial trade between Spain, Mexico and the Philippines. 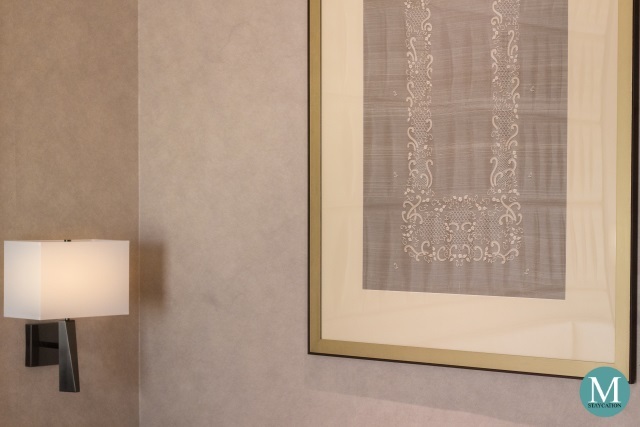 Another wall features an intricately embroidered hand-woven fabric made of pineapple fibers. This cloth is the material used to make a barong tagalog, the national dress of the Philippines. In the old times, barong tagalog was worn by the nobility while in the present time, this garment is a formal attire worn in special occasions. The seating area is my favorite spot in the room. The chair itself was very comfortable. The natural light from the window makes this area ideal for reading a book or a magazine. I was also super impressed by the welcome amenities provided by the hotel. In addition to the fresh fruits, they also served us cheese tarts made with local cheese. 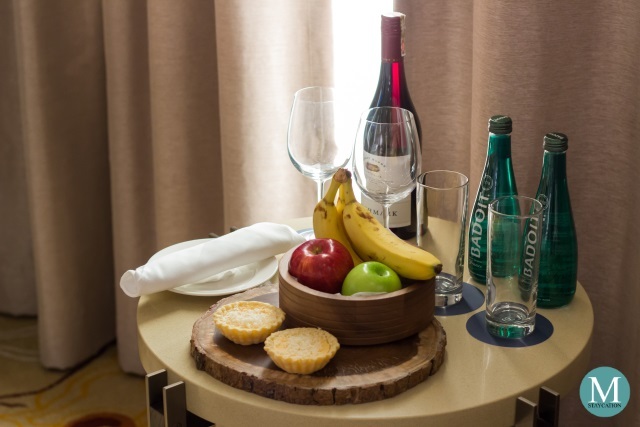 We also received two bottles of sparkling water and a bottle of wine for being the first SPG/Marriott Rewards member to check-in on the hotel's opening day. 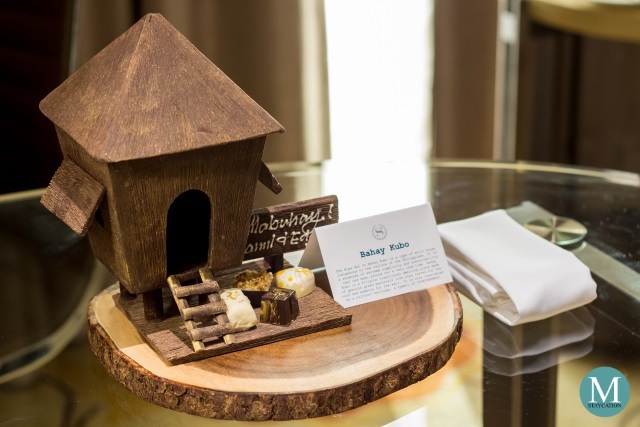 Another special gift we received from Sheraton Manila Hotel was a bahay kubo (nipa hut) made of chocolate. Except for the wooden tray, the whole thing was edible. Bahay Kubo is a native house in the Philippines and it symbolizes the family-oriented culture and the warm hospitality of Filipinos. The working desk has an elliptical glass surface matched by an ergonomic chair. There are USB ports as well as power outlets with universal socket. LAN and wireless internet connection are both available inside the room. The working desk can also serve as a dining table. 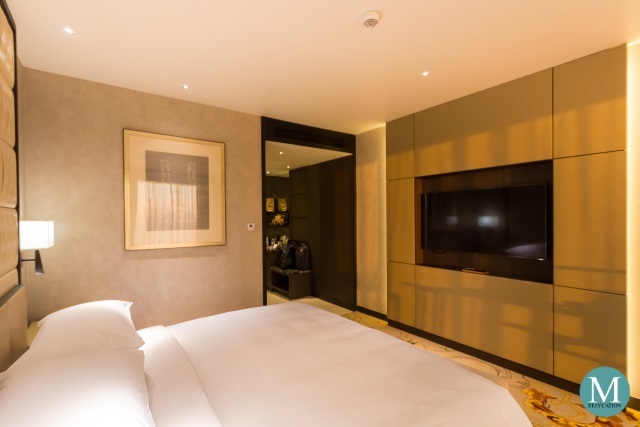 The Deluxe Room is equipped with a 55-inch full HD Smart television with local and international cable channels. If you have Netflix intalled in your smartphone, you can connect it to the Smart TV to watch movies or your favorite series. 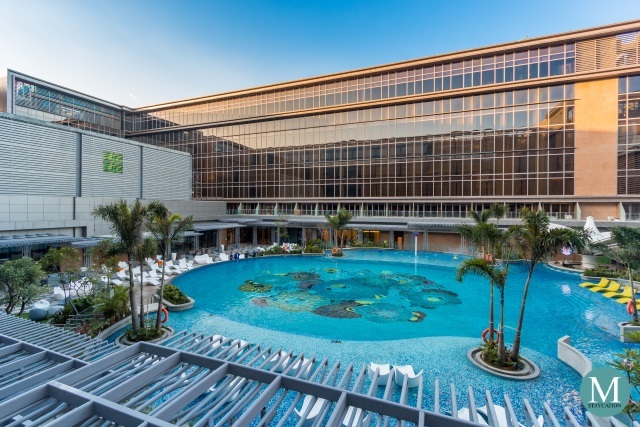 Consistent with my sleep experience at Sheraton Bali Kuta Resort, I also had a very restful sleep here. The Sheraton Signature Bed had a very thick duvet topper which made it very comfortable. The room's air-conditioning works perfectly. I set the temperature to 20 °C and the room remained constantly cool during my whole stay. 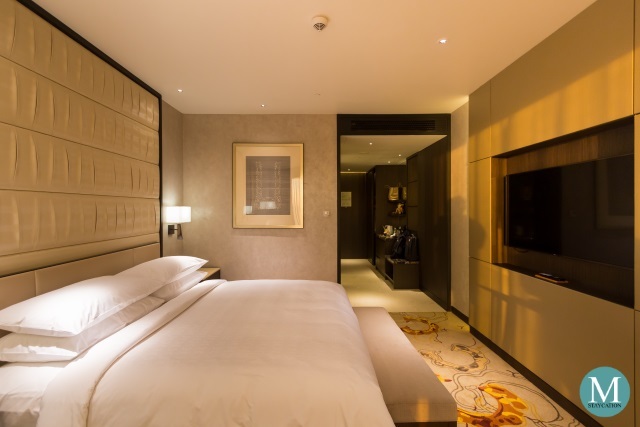 Switches to the in-room lights as well as USB ports and power outlets are conveniently located next to the bed. 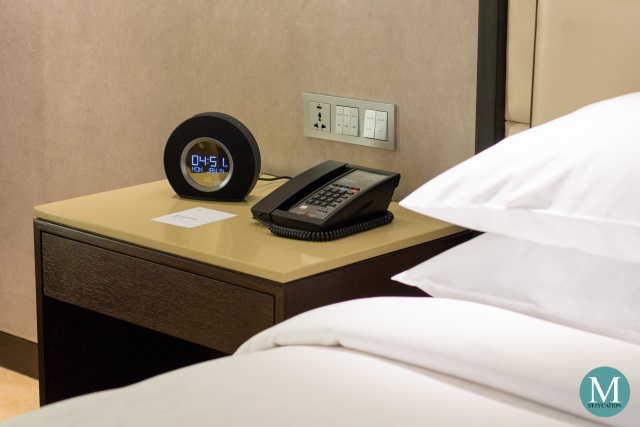 The room is also equipped with my favorite brand of clock radio, the JBL Horizon Bluetooth Clock Radio. I was able to connect by smartphone to it and played my favorite Spotify playlist to set the mood inside the room. The closet cabinet is located next to the room's door. There is enough storage space to hang clothes for a week-long trip. There are also drawer cabinets to store folded clothes. 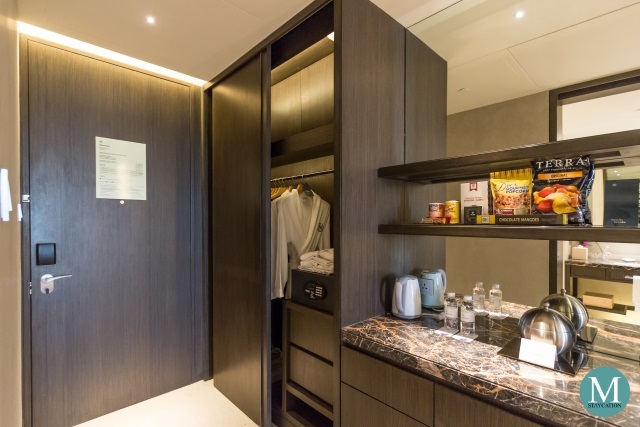 Two sets of bathrobes and room slippers are also stored inside the cabinet. An iron and ironing board, as well as an electronic safe are also stored inside the closet cabinet. Next to the closet cabinet is the minibar. The mini refrigerator is fully stocked with bottled juices, canned soda and beer. There are also snacks like chips and chocolates. 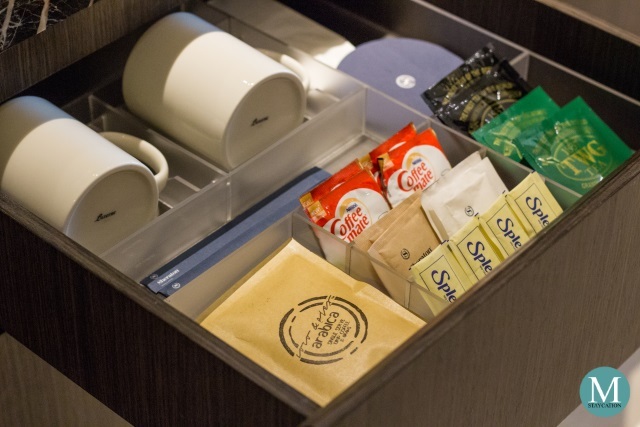 Complimentary bottled water, TWG teabags, and drip coffee are replenished daily. There is an electronic kettle to heat water. 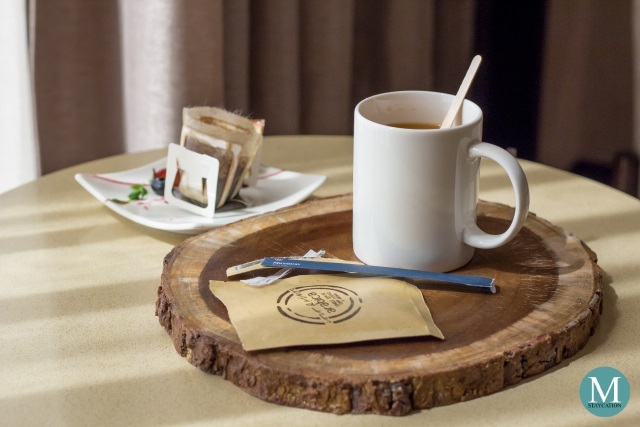 I particularly appreciate that Sheraton Manila Hotel provides drip coffee instead of instant coffee. 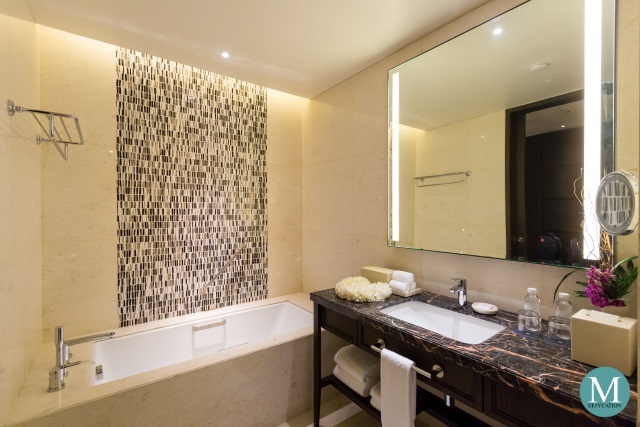 The Deluxe Room has an equally spacious marble bathroom. It has a separate bathtub and a walk-in shower. 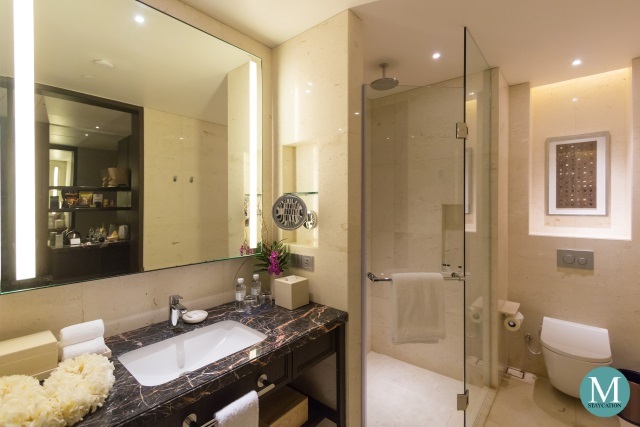 The bathroom has a single basin with plenty of space on the counter-top. Hand towels and bath towels are placed on a rack under the countertop. The walk-in shower is fitted with a handheld and a rainfall shower-heads. Water pressure is strong and hot water from the shower is almost instantaneous. The toilet is fitted with a bidet seat cover. 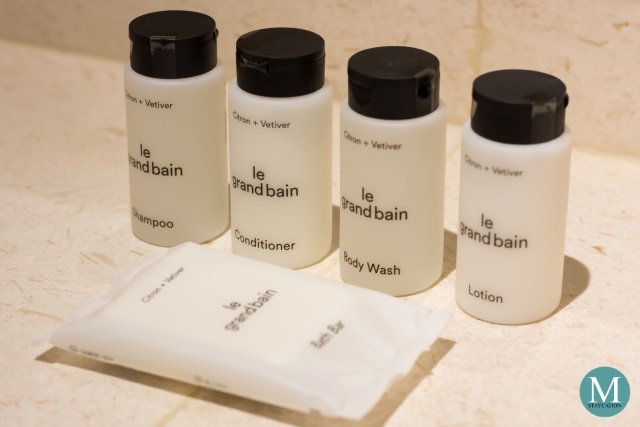 Guests staying at Sheraton Manila Hotel are provided with Le Grand Bain body and bath amenities. The refreshing citrus and lightly woody scent was exclusively designed by Ben Gorham of Byredo for Sheraton Hotels & Resorts. The complete set includes a bath bar, body wash, shampoo, conditioner and lotion. 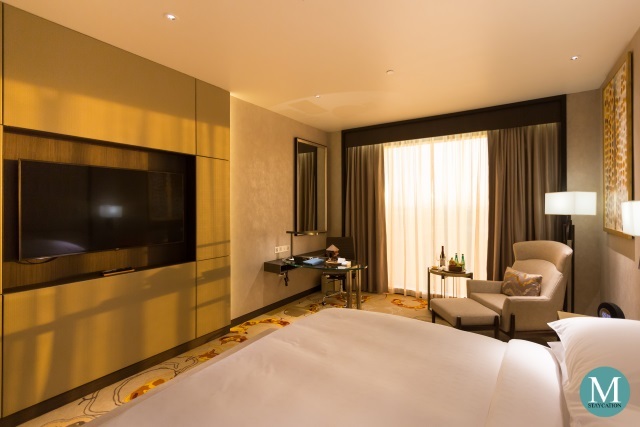 Overall, I enjoyed my stay in this Deluxe Room at Sheraton Manila Hotel. 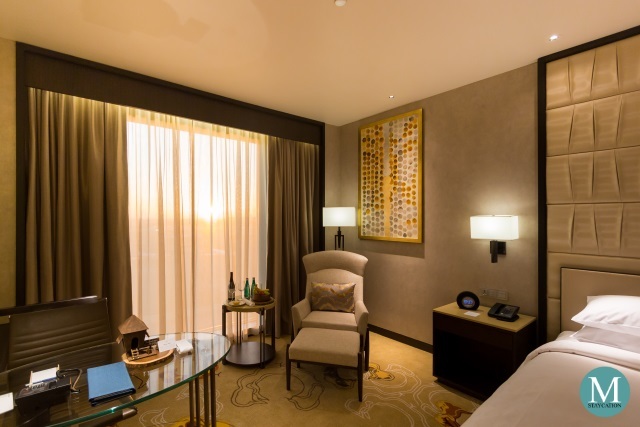 The room exceeded my expectation, especially the interior design which integrates elements of Philippine design and history, giving this Deluxe Room a local character which adds to a memorable stay experience. Staycations - this is one of the most spacious lead-in guestroom categories in the city, big enough to accommodate families with small kids, guests may opt for a 2 Queen Beds configuration for a more comfortable sleep, with in-room dining service available 24 hours and a 55-inch smart television, you can surely enjoy your time with the family without stepping out of this room. 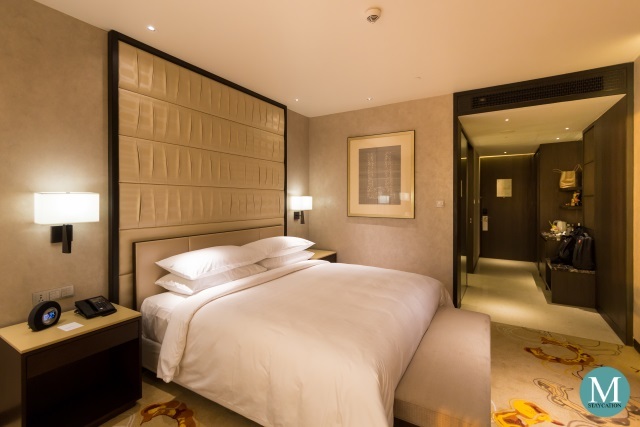 TIP: If you want a Deluxe Room with a view similar to this room, specify in your reservation to be placed in a high floor with room number ending in -39, -41, -43, -45, -47, -49, -51, or -53. The room number ending in -39 is nearer to the elevator while the room number ending in -53 is farther from the elevator.